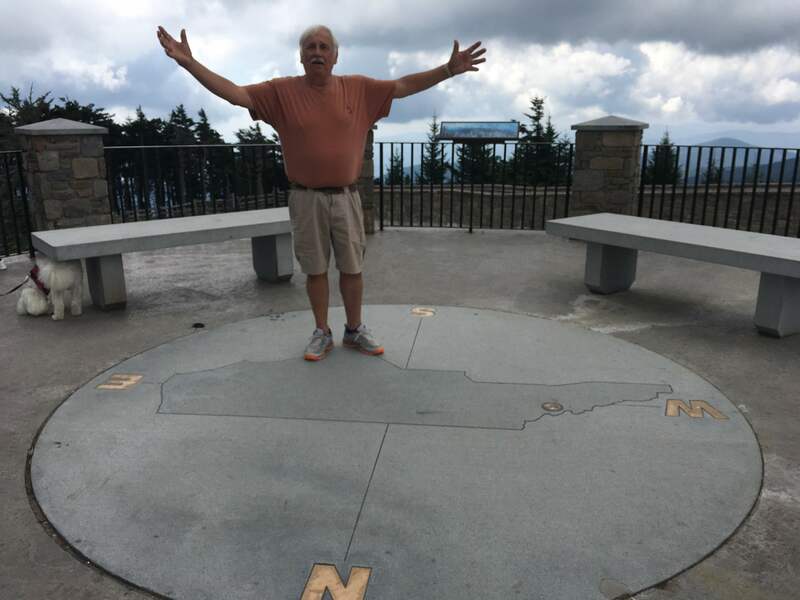 North Carolina – Let's Go RVing! After hours of researching and discussion we finally decided that our January trip this year would entail seeing parts of Texas we had missed previously plus a lot of New Mexico. We had planned to leave around January 3 but then NC State got a bid to play in the Gator Bowl in Jacksonville, Florida. We decided we could just leave earlier and go to the Gator Bowl and then take off for the travels. Meeting my cousin, Becky and her husband Billy just added fuel to that idea so it was planned. We were leaving December 28 for approximately six weeks on the road. Needless to say I had to take every piece of clothing I owned. After all, we would be dressing for warm Florida weather and cold New Mexico weather. Leaving three days after Christmas presented some obstacles but strangely enough we seemed to get everything done in a timely manner. All of the children and grandchildren were at our house Christmas evening for dinner and gift exchange. At the end of the evening after we finally got everything cleaned up and put away we fell into bed exhausted not sure if we’d be able to get any trip preparations done. Wednesday morning as soon as the kids left we went out to the warehouse to get the motor home. Oh what a sweet sound when it started and we did not hear the click, click, click of a dead battery. A battery disconnect is a real deal! Getting it out of the warehouse would have been a real challenge for me as it was behind a big RV and sandwiched in between the wall and a boat but Jerry assured me there was enough room. Although I was in front of him giving him left, right, straight directions he didn’t need them as he easily navigated it right though the narrow space. The rest of Wednesday was spent taking down the easiest of the Christmas decorations and visiting with the children. Thursday though we hit the floor running. The biggest challenge was getting the Christmas tree down and ornaments put away. Keeping in mind that our house is on the market and could be shown while we are gone we had to leave everything in show ready condition. Amazingly we did it! It wasn’t perfect but it would pass. Christmas decorations down, floors vacuumed, dusting done and bathrooms cleaned – enough! Jerry wanted to leave between 8:00 and 9:00 and we walked out of the door to the coach at 8:50 however by the time we got the steps in (yeah, they were a little problematic this morning) and had gone through the check off list and shared a brief payer time it was 9:05 when we pulled out of the driveway. The morning ride was filled with heavy rains and wind until just before we hit South Carolina. As usual we stopped in Latta, SC at the Flying J for gas and also pulled into a parking place and had lunch. We were making good time, Jerry felt good so we decided to wait to try to locate somewhere to spend the night and then … we ran into a traffic jam. A lot of the time we were going (if we were going at all) 15 mph and then occasionally we would speed up to 25! As we slowly ambled down the highway we noticed a big RV towing a car on a car dolly all the way off of the road nearly into the center guardrail. No idea what happened though and we didn’t see anyone. Apparently there are a lot of snow birders heading South pus I’m sure there is a lot of holiday traffic making it a slow ride down I 95. Also saw a big semi jackknifed on the side of the road. Maybe that should have told us to stop! In the fall of 2016 I planned a short trip through Virginia ending up touring around Pennsylvania – then came Hurricane Matthew. Obviously our trip was canceled. In fact when I called to cancel our reservations all I had to say was “I’m from Eastern North Carolina” and the reservation was canceled with no problem. This year we were scheduled to attend a wedding in Norfolk, VA on the week-end of September 28. Since we had some free time we decided to again try for Pennsylvania. When I plan a trip I make a draft of our route, places to stay and things to do. Needless to say as I work on the trip I update the draft. I was on Draft Nine when we started hearing about Hurricane Florence coming in as a Category 4 on the North Carolina coast. As the storm very slowly wound its way toward our coast we knew we would be home for the duration so no trip to Pennsylvania. We went down to our home on the Pamlico River and secured things as best we could and prayed we had done enough. When we arrived back in Kinston we put the RV along with my Jeep in the storage warehouse to protect them from wind and potentially rising water. Our thoughts at that time were to plan on living in the RV in our driveway if we lost power. Then we began to prepare for the storm itself. We bought groceries and eventually were able to find a case of the very hard to locate water. By Wednesday, September 12th we were as ready as we could be. We stayed glued to the television as we watched the track wax and wane toward us. Each night as we went to bed we had no idea where the storm would be the next morning. Needless to say there were some sleepless nights as we heard the wind roar around our home. Fortunately we never lost power so we had AC and access to television and Internet. Although I am not a Facebook fan due to all of the vitriolic political postings I frequently checked in there. There were constant updates from our county Emergency Center plus many people posted their conditions. The rain came down in torrents and we began to wonder if it would ever stop. In total I think Kinston got nearly 20 inches during those few days however many communities got a great deal more, some a historic three feet plus. To say that Eastern North Carolina has been devastated is a huge understatement. The city where I used to work, New Bern only about 35 miles from here, looks like a war zone. It is heartbreaking to see that so many have lost everything they own. When we need work done on our RV we take it to Wilmington, about an hour and a half from us. That city too is beyond description and a week later they are still without power. Schools have been out all week and some counties are just posting that schools are closed until further notice. On Saturday, the rains seemed to lessen a bit and since the storm took the southern route Jerry decided that we could go check on our river house. We had been in contact with our neighbor who bravely stayed and they kept us up to date with damage reports. I still was unprepared for what we found. We were missing several steps going up the back way leaving us to carefully move from one to another hoping that it was secure. The entire steps to Jerry’s workshop were gone and the small porch was hanging by a thread. It was still surrounded by water so it was inaccessible. Our little dock was gone however there was a dock in our yard, not ours though. The bulkhead was breached and along with the water were many rocks from it. Our beautiful patio that Jerry worked so hard on was damaged but nothing was missing. It will be a lot of hard work to repair it but it can be done. We had some leaks in the river room (sun porch) but other than that we couldn’t see any more damage. I was afraid we’d see more when we returned later. Many of the residents were out and about tromping through the standing water and waves accessing the damage. We only stayed about an hour as we were afraid we would run into rising water on the way back to Kinston and we did! There are only two ways to access Pamlico Beach, the main highway and then a little shortcut behind the main road. When we got back to the turn off the main highway was blocked. We didn’t know if it was due to a damaged bridge or high water but we had only one other way out, the back road. It was covered in standing water so we slowly and cautiously made our way through. We made it back home and other than a trip to church on Sunday we stayed close to home. The rains continued intermittently through Tuesday and then we saw the sun shine. What a beautiful sight among all of the devastation. To the many volunteers who have come to Eastern North Carolina we cannot say thank you enough. Linesmen have come from Louisiana, Tennessee, New York and several other states. To the Red Cross, simply put thank you. Shelters are opened and distribution centers as well. We went to Sam’s yesterday and stocked up on towels and canned foods to drop off there. Eastern North Carolina has been hit hard and there is much damage and more to come as the waters continue to rise. Flooding will become an even bigger problem but ENC is resilient and the damage is not insurmountable. We will pull together and we will survive. Oh, on a lighter note, my friends have asked me not to plan another fall trip to Pennsylvania. We don’t do well with the “F” words – Fran, Floyd, and now Florence, etc.! Up and about this morning as we had about 200 miles to go and an errand once we arrived at our destination for the evening. Fortunately the only difficulty was locating a gas station we could maneuver around and that was easily accomplished. We arrived at our Harvest Host site around 1:00 in the afternoon. I went in and spoke with the host who gave us two ideas as to where to park. 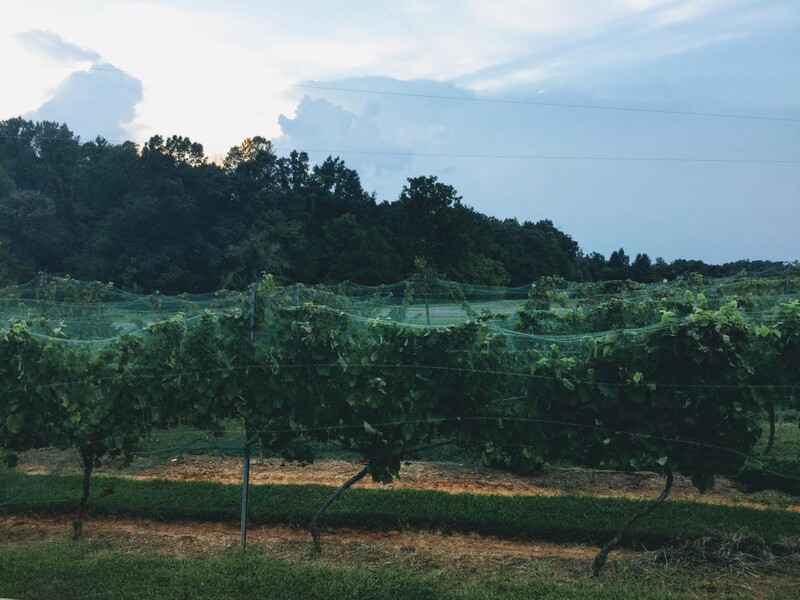 We elected to park next to the vineyard right there at the winery. After lunch we went in and I had a wine tasting. As my friends tell me I am a wine neophyte meaning I don’t know anything about wine and I only like a couple of the semi-sweet ones, a moscato or ruscato so tasting the chardonnay was interesting! I actually bought two bottles as gifts for friends. We ran our errand which took us into Greensboro and we spent most of the afternoon there. When we returned to the winery about 6:00 everyone was gone and it was mighty quiet. I mean we were in the country! Although we had the AC on we had not pulled the shades when we left and the setting sun had shone brightly into the RV heating it up quite a bit so it took a while for it to cool down. Lesson learned! Don’t forget the shades when it is 90 degrees plus outside and the RV is parked facing the western sunset. We warmed up leftovers for dinner and then settled in for the evening. I glanced out of the window at one point and realized that it was mighty dark outside, not a light to be seen, we were alone in the country and it was a bit spooky. It got even spookier in the night when I was awakened not once but twice when we had a severe thunder storm. When the second storm hit I thought someone was beating on the door so I woke Jerry up. It was only thunder and pouring rain and all was fine. Scaredy Cat that I am. Although the owner had told us that they would be out early picking grapes we never heard them. I assumed that the heavy rain prevented them picking that day. We headed out early to Raleigh and the NC State Fairgrounds where we spent the week-end. Saturday was my birthday and Jerry told me he was having a party for me with 55,000 of my closet friends – we were going to the NC State vs James Madison football game! NC State won. It was not pretty but it is a “W” in the record books! When we got up Sunday we got the linens and towels washed and ready for our next trip leaving on September 12th. A quick ride home, parked the coach and off to the river we went. Guess one can see why it is difficult to answer the question of where we live. Our 6 year old grandson, Eli is just too funny sometimes. He spent several days with us a couple of weeks ago and on the way home from church we were discussing how funny he was. Jerry said that when he grew up he should become a comedian. Eli’s response was “you can be paid for being funny?” When I replied yes he emphatically said “Well Missy, get a hustle on”! He usually calls me G or GiGi but never have I been referred to as Missy. Of course Eli got the response he wanted as both Jerry and I burst out laughing. 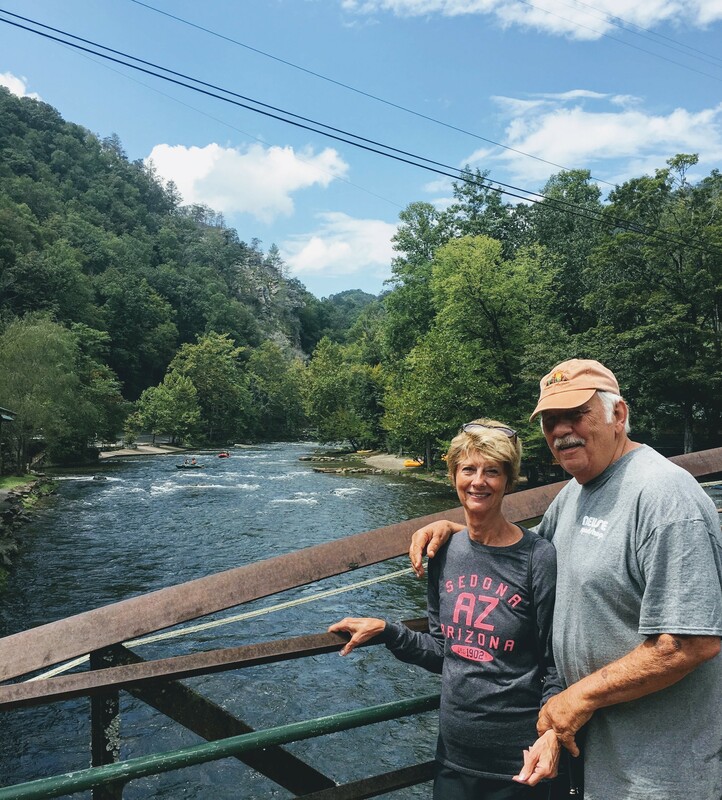 Well, yesterday I gave Jerry the website for the Nantahala Outdoor Recreation site to see if he was interested in white water rafting. Considering the expense I had no idea what he would say. He burst in the room with a “Missy, get a hustle on and let’s go” so I began planning the day. Since neither of us had ever been white water rafting we decided on the 3 hour ride which had beginner status. The times were 9:00, 10:00, and 1:00. I was leaning towards 1:00 as I thought it might be warmer then but Jerry suggested 10:00 so that’s what we decided on. Wednesday morning was covered in fog and the weather forecast called for rain around 2:00. We were supposed to be at NOC by 9:30 and since we didn’t know exactly how long it would take us to get there we left a little after 8:00. That was a good decision because before we could get too far out of Maggie Valley we ran into a road block. Trees and power lines were down and they had no idea how long it would be before traffic was allowed. The poor man delivering the message said he had already been cussed out twice before we got there. We asked for directions, thanked him and began an alternate route to NOC. We ended up on the Blue Ridge Parkway which continued to be foggy except when the blinding sun shone through on the highway. Needless to say it was full of ups and downs and winding roads. I’m quite sure it is a beautiful drive when the weather is good and there are no worries about being late for an appointment. If we were late, we forfeited the $100 we paid so we continued on. We actually arrived almost exactly at 9:30, right on time. After we checked in and signed the appropriate waivers we walked around a bit. I had been told to be sure we were with good strong adults. There were two children in the group accompanied by their GiGi and Papa. Guess who we were paired with? Yep, you got it. No strength there. 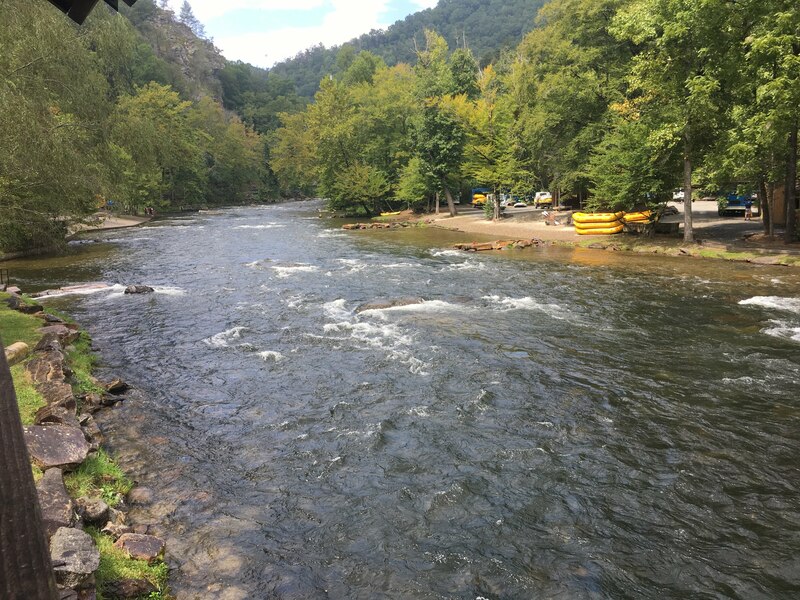 After getting fitted with PFD, personal flotation devices or more commonly known to us as life preservers we watched an introductory film on riding the rapids. Although it was unlikely to happen we were instructed on what to do should we fall out of the raft. Head up, toes up and hopefully get back in the raft. Do not stand up as the bottom is full of rocks that could do a lot of damage. The river depth is controlled by a dam and stays a pretty consistent 55 degrees. In other words, pretty chilly! We were instructed on how to place our feet to best secure us in the raft. My feet were in cold water although as the ride progressed I’m not sure if they acclimated to the cold water or if they were just numb but the water didn’t bother me. Poor Jerry stuck his foot in the instructed area. The GiGi in front of him elected not to it on the side of the raft but right on top of Jerry’s foot. He couldn’t move it, couldn’t get it out so there was never any danger of him falling out of the raft! It was an uneventful ride in that no one fell over. We did get stuck on a rock a couple of times and our guide, Orion had to get out and manually push us off. Both of the kids jumped in for a very brief swim. It was a fun ride, not quite as challenging as I had thought though. Jerry and I both decided that we’d like to go again but would like a more adventuresome ride the next time. We’re looking a little rough here!No pride! After the ride we went to a nearby restaurant River’s End and had burgers. I had a hot cup of coffee too! Jerry said his burger was delicious, mine not so much but the view was beautiful and the service was great. Afterward we wandered around the gift shop and wonders never cease – I didn’t buy a magnet or t-shirt! With the detour no longer in force we had a shorter ride back to the RV park and I headed right toward a warm shower. Ah, it felt so good. I was still a bit chilled though so I went outside and just sat in the warm sun until I thawed out completely. It took my poor feet a while! We had earlier decided that we would return to Maggie’s Seafood Restaurant where we had eaten last year. I wanted some rainbow trout which is what I had gotten last year. Jerry had gotten gator bites last year but this year decided to join me in getting the trout. We had calamari for an appetizer and then the trout, mine broiled, his fried. Although mine was good Jerry didn’t enjoy his as much so guess we won’t be returning to Maggie’s next time we are in the area. Back to the coach and a little preparation for leaving in the morning. Hoping to be on the road by 9:00 as we’ve got a little over 200 miles to go and an errand to run once we get settled. Tuesday was a trip to Mt. Mitchell. Bless our GPS’s heart it took us right through the heart of Asheville and then a very windy road until we finally arrived at Mt. Mitchell State Park, the first state park in North Carolina and the highest point east of the Mississippi. We rode up to the top and then hiked up to the observation deck where the elevation was 6684 feet. Despite the cloudy day the view was beautiful. Halfway back down from the observation deck we took a detour and navigated the Balsam Trail. What a fragrant hike surrounded by Frazer Firs and Red Spruce plus other beautiful foliage. It truly smelled like Christmas! Because of the extreme weather at the top of Mt. Mitchell very few trees can survive in the park. Some of the survivors are yellow birch, mountain ash, fire cherry and red-berried elder. 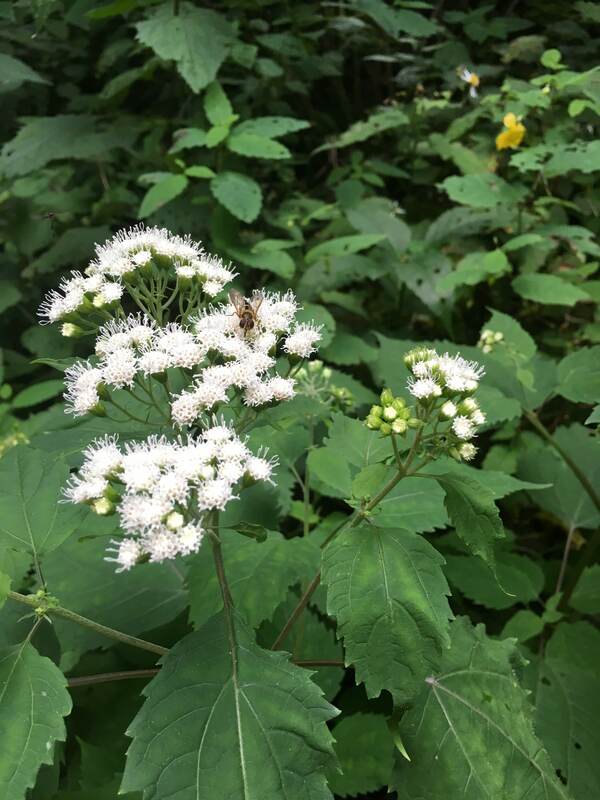 Interestingly enough though the cool, moist conditions make it an ideal place for numerous wildflowers including White Snakeroot, Mountain St. Johnswort and Wood Sorrel to mention just a few. As we walked along we saw many examples of these wildflowers. 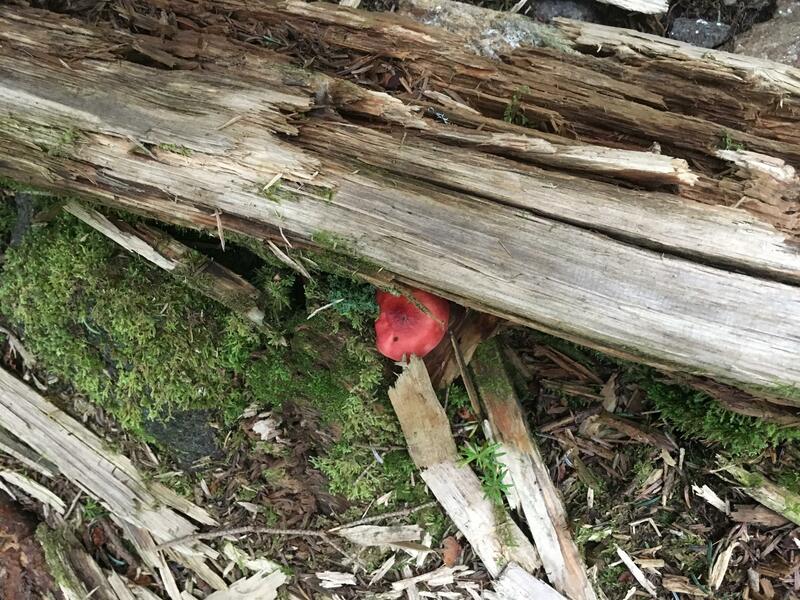 Although the area is supposed to be a mecca for mushrooms we saw only one, well we only identified one, the red gill webcap. After completing the fragrant hike we enjoyed our picnic lunch gazing out over the lovely mountains. Our next stop was the Zeb Vance Birthplace. We toured the small museum where we learned that Vance was a charismatic, plain speaking man. Before political debates were televised candidates would spend months traveling from town to town to campaign on the leading issues of the election. Because the candidate often had to stand on a tree stump so the crowd could see and hear him their speeches were called “stump speeches”. With his plain manner of speaking and sharp wit, Vance was a celebrated stump speaker. After touring the museum and learning more about Zeb Vance who served two terms as governor although not consecutive, we wandered around the grounds where we saw several building including the main house which actually had an upstairs. Returning to the campground we rested a bit, had dinner and then walked around the park for a while. It is a lovely park with what appeared to be travelers (like us) and some seasonal visitors. Over the week we met several people from Florida who come up to spend the month of August in the mountains. Guess it is cooler than Florida but the temperature increased each day we were there. It got a little hot! 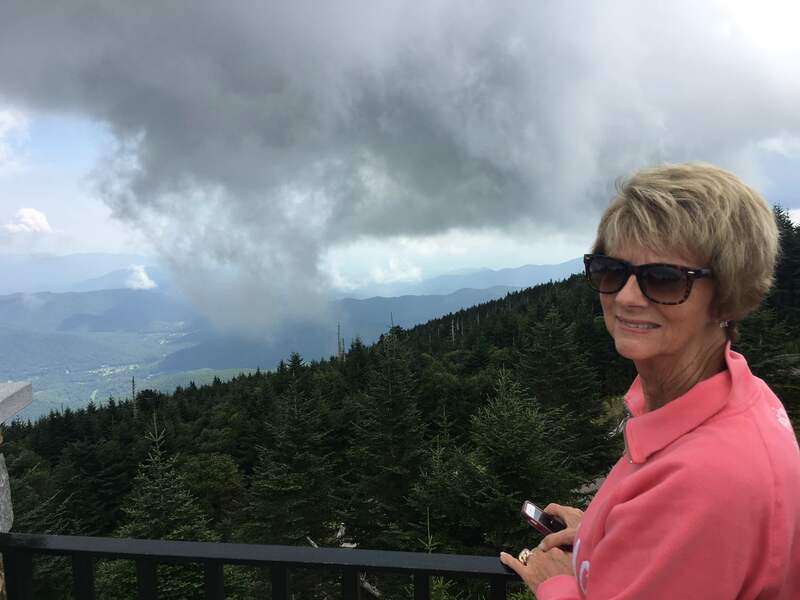 Resting, relaxing, driving (riding), touring, hiking, a little bit of everything during our visit to the NC mountains. Since we couldn’t check into Pride RV Resort until noon we packed up and then walked over and said goodbye to our new friends, Elaine and Paul. We arrived in Waynesville at Pride RV just before 12:00, checked in and quickly set up on site F13, just one row back from the stream but with no one in front of us we had a good view. After lunch we rode into Maggie Valley and went in a couple of shops. We stocked up on our once a year purchase of sweet onion relish and headed back to the rv park. On the way we stopped at one of Jerry’s favorite places, the local lumber company where he had previously bought some end cuts to work on at home. He brought ten end cuts of cherry, oak, and maple. He will surely be ready for time in his workshop when we get home. Back to the park where we spent a relaxing afternoon. 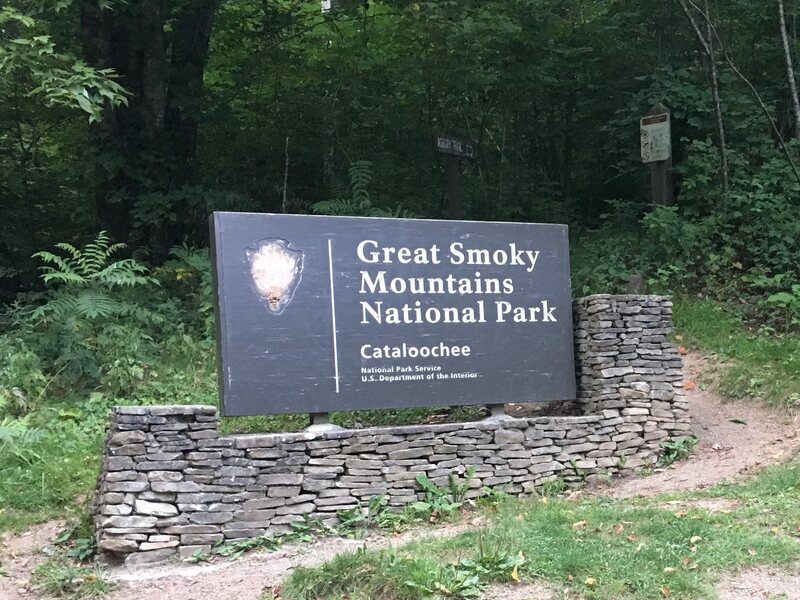 Monday evening we rode to Cataloochee Valley located in the Great Smokey Mountains National Park where we were hoping to see some elk. We had been a couple of years ago and after spending at least an hour there we saw one lone elk – at a distance so we weren’t too hopeful this time. The road to the valley is up and down, paved, graveled or dirt, and curvy, winding and narrow. As we ascended we met a number of cars coming down so we were afraid we had missed the elk. Boy where we wrong. 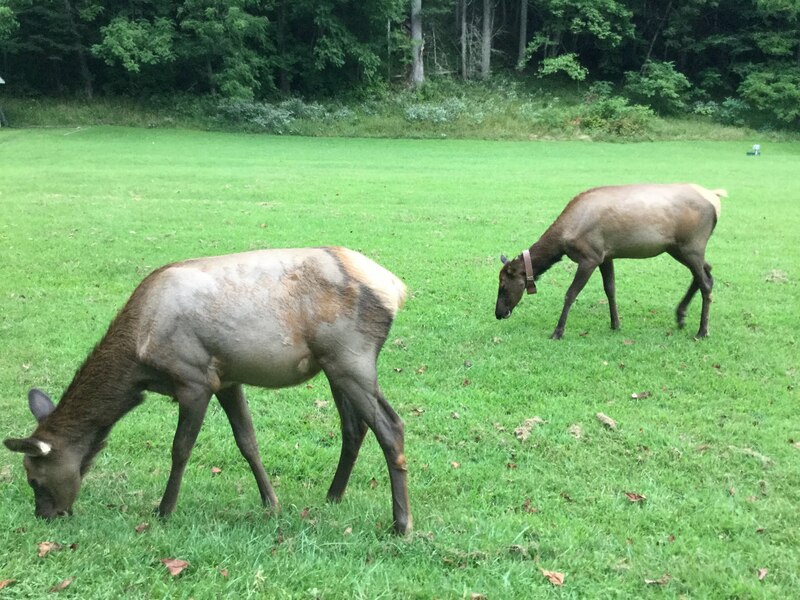 As soon as we entered the park we began to see elk. As we continued on we were suddenly stopped by elk standing in the road or crossing by. They were close enough that I could have touched them! It reminded me of posts about Yellowstone where traffic is stopped for bison. Traffic was stopped here for elk and there were many novice photographers around including us. Unfortunately Jerry had not brought his good camera so all of our pictures were with the iPhone but they still turned out pretty good. We probably saw about 20 elk plus two bulls and we even heard their cries. They seemed to take all of the people in stride and unfortunately did not appear afraid of all. 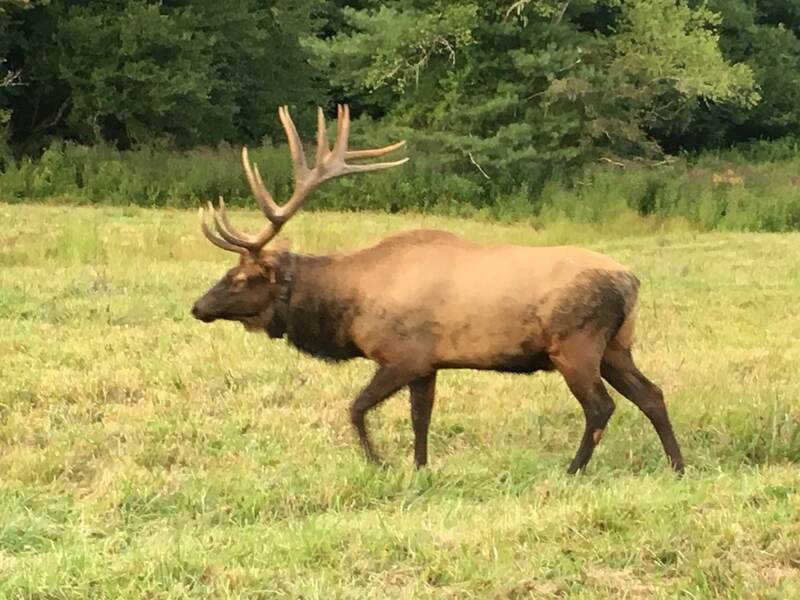 The elk were repopulated there several years ago and the population has increased a great deal. The best time to see the elk is at dusk and the best time to go back down the mountain is before dark so we obviously didn’t stay a long time, but long enough to really enjoy the beautiful animals. After finally getting a good night’s sleep I was up pretty early and when I peeped out of the window it was so foggy I couldn’t tell what the weather would be like. The fog stayed with us for a while but finally lifted and it turned into a beautiful day. We just hung around the coach most of the morning. I sat outside and read for a while just enjoying the beautiful weather. A main facet of being in the Carolina Guroos is meeting and getting to know new friends. Generally when Jerry and I travel we are up and out every day touring the countryside but when we are at a rally we relax and do a lot of visiting. That was the agenda for the day until 5:00 when the rally officially began. We all met at the club house for a business meeting and dinner, then played games for a while. After a return to the coach we sat outside for a while and then turned in early since it was getting a little cool outside. Another slow start to the day on Friday but we all met at 11:15 for a trip to the Dillard House in Dillard, Georgia for a delicious luncheon. The delicious food is served family style and included fried chicken, fried zucchini, mac and cheese, butter beans, cabbage au gratin, green beans, cheese biscuits, corn bread, fried catfish, country style steak, country ham and so much more plus it was topped off with a strawberry cobbler with ice cream. Perhaps not our usual fare and with all of the fried foods not the healthiest meal I’ve ever eaten but oh boy, was it good. I knew I wouldn’t be eating dinner that night. After some running around to the grocery store, etc. we returned to the campground. I had volunteered to be on the planning committee for scheduling the rallys for 2019 and we met in the afternoon to offer up ideas. Afterward everyone gathered for a wine tasting and a good time was had by all! It was a fun day of fellowship and getting to know some of the other Guroos better. In the evening we had an ice cream party (like we needed more food) and games and then Jerry and I made an early evening of it. It had been a full and busy but fun day and we were tired! Saturday dawned early for us as we had a three hour drive to Clemmons to celebrate our oldest granddaughter’s birthday. Never let it be said that we are not great grandparents! The party was fun and getting to visit with three of our grands made the trip totally worth it. We got back to Franklin around 7:00, ate some left overs and then what did we do? We visited, of course! As is usual the Guroos met on Sunday morning for biscuits and coffee and a devotion then most everyone left for either home or other destinations. We had decided to stay another evening as I figured we would need some recuperation after six hours in the car on Saturday. I was right! Other than a trip to the grocery store along with new friends Paul and Elaine we had a quiet day. I went to the pool for a little while and boy was the water frigid. Our river water is warmer! I walked over to Elaine and Paul’s in the early evening for a brief visit and then back to the RV and bed! It was a great rally. We got to see old friends and meet new friends. Excited about the next rally in October in Myrtle Beach. I strongly encourage all RVer’s to join FMCA. The cost is minimal and the benefits are outstanding. In addition, joining a local chapter is just icing on the cake.